Uploading in HTML has always left much to be desired from developers. With the introduction of the File and Drag-and-Drop APIs, we are beginning to see improvements across many sites whose core functionality relies on uploading. In this first of a series of tutorials on advanced uploading techniques, we will discuss reading file information and posting that up to a server. Of particular importance to this will be the concept of chunked uploading. Uploading files which are only a few hundred kilobytes in one go is all fine and good on a standard connection, but what of mobile uploading? Or video files in excess of several gigabytes? 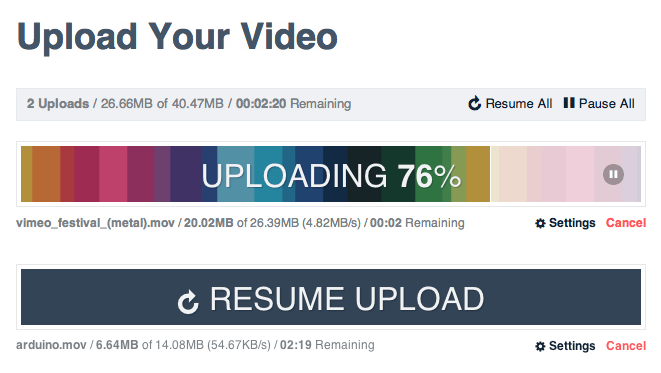 As upload duration increases, so too does the possibility of failure. In the case of a failed upload, the user has no choice but to restart the upload from the very first byte. Not only does this cause aggravation for your users, but it also wastes resources on your upload machines. Chunked uploading by contrast, allows us to break a large file into small chunks, and send these pieces to the upload server one-by-one. If an upload fails, we need only resume from the last successful chunk. This also gives access to another important concept: pausing and resuming uploads. In the case of uploading multiple files at once, this allows us to de-prioritize non-essential files. Another benefit is that we can pair our uploader with the Connection API to automatically halt the upload process if the user loses connection to their WiFi or mobile network. In short, we aim to make an uploader which is as resilient to failure as possible. * in the file list, and enables the submit button for uploading. Brilliant! We’ve got our files selected, listed, and ready to upload. We are going to be making a lot of AJAX requests, so let’s first encapsulate those into a class that we will assign to each of our files. // out of the function. * process, preventing default form submission. Files are getting read into our application and bytes and being sent out in tiny chunks over AJAX! Take a moment to stop and realize just how cool that really is! Amazing as it is, the end user still hasn’t seen any difference in their experience. So let’s add button wich allows them to pause and resume uploads. This will allow users to free up bandwidth if they need to complete another data-sensitive task, such as having a video chat on Skype or pwning some n00bz. When their chat/frag session is over, they can resume their upload where they left off without having to start the process over again. Onward! * Toggles pause method of the button's related uploader instance.